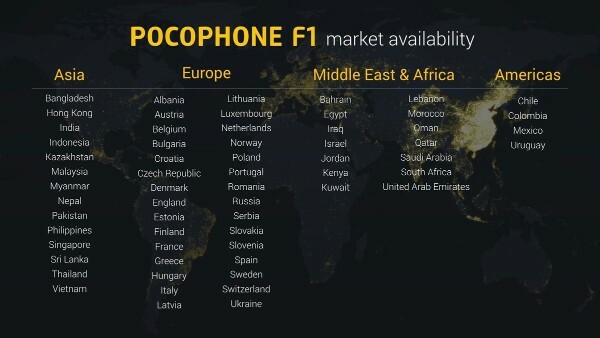 Xiaomi based Pocophone smartphones launched the POCO F1 and brought in a new budget segment device that offers you almost all the flagship device features and is priced aggressively. The highlight feature of the POCO F1is its price which is unbelievable, it comes with all those big features like the fastest processor, awesome cameras, good battery life and all at a price of a budget segment device. POCO F1 has a lot to offer and has questioned everyone’s mind what do these big smartphone manufacturers offer on their phones if devices like POCO F1 are providing the best at your price. Let’s check out in our in-depth review on the POCO F1 – the new budget flagship device. The POCO F1 comes with the beautiful 18.7:9 edge-to-edge display that gives you a complete full-screen experience. It has the FHD+ screen resolution of 2246 x 1080p and the system level full-screen gestures give you an intuitive experience with the POCO F1. The device also comes up with the internationally renowned Corning Gorilla Glass which protects it from wear and tear making the POCO F1 build to last for a longer time. It also offers some additional display modes like the sunlight display, night display, and color temperature adjustment. 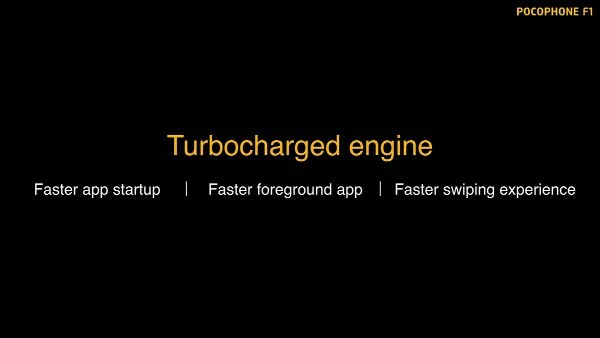 Another key feature of the POCO F1 that makes it unique from the other smartphones is that it is powered by the latest and fastest Qualcomm Snapdragon 845 processor with AIE 845 meaning that you get the Qualcomm’s most powerful AI engine on this flagship which gives you an ultimate performance with lower power consumption. 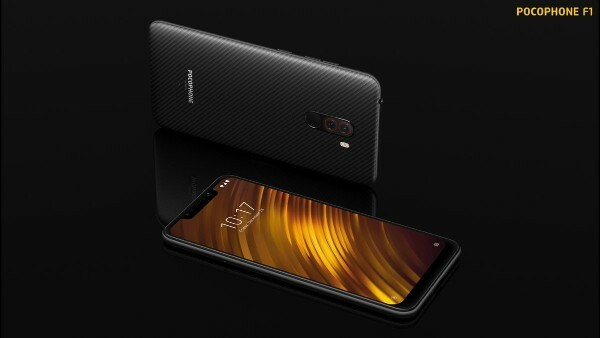 The tailor-made MIUI is specially designed for POCO F1 to make it lighter, faster and smoother while accessing apps and gives much faster app startup experience, more sensitive touch and the customize App drawer intelligently categorizes the app so that you can access them easier and faster. The MIUI also keeps your phone secure with latest patches and updates from Google. Also Check: MIUI Based Poco Launcher Now Available For Your Android Smartphone! Many flagship devices offer the latest features in it with some awesome build quality and decent pricing but when it comes to the heating issues while heavy usage of the memory most of these devices don’t perform well as expected. POCO F1, however, comes with the LiquidCool Technology that keeps the CPU of POCO F1 cool and hence the smartphone’s performance does not gradually fall. POCO F1 provides you the perfect shots under any conditions with its smart AI dual camera that gives instant autofocus even in dark environments. The rear camera comes up with dual 12MP + 5MP lens which enhances the photo brightness, clarity, and quality. It has features like the Dual pixel autofocus, low light enhancement, HDR imaging, and EIS for video recording. It has the 20MP Front Camera coupled with the 2µm large pixel technology that gives you gorgeous selfies and AI Beautify 4.0 with precise bokeh shots deliver studio quality shots. 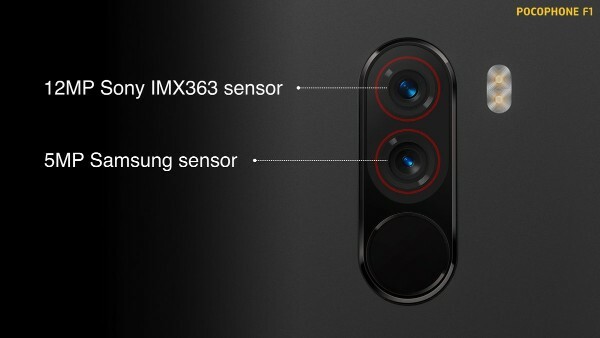 The front camera also has additional features like the AI detection up to 10 scenes, AI portrait mode, face recognition. 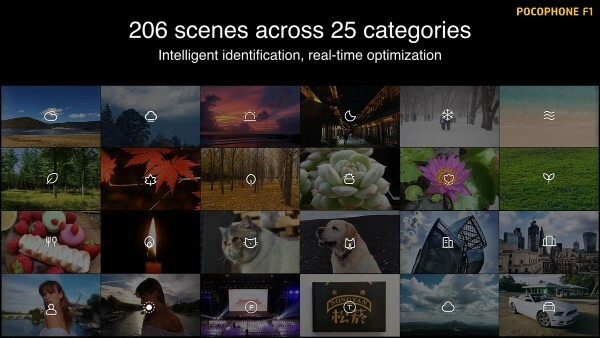 POCO F1 rear camera comes with the AI Scene detection which easily can distinguish across 206 scenes and automatically adjust exposure, saturation, and other photo optimizations. Also, additional scene detection is added specially for India. POCO F1 packs with powerful 4000 mAh battery with QuickCharge 3.0 which makes a perfect combination along with the USB Type-C port. This huge battery life helps you to keep your phone going as you do all your stuff till the last minute and provides you enough power for almost 30 hours with no issue of battery draining as fast charging rapidly replenishes power. IR Face Unlock – POCO F1 is equipped with an infrared face recognition sensor which unlocks your phone instantly and works quite well in the dark as well. POCO F1 Armoured Edition – The POCO F1 Armoured Edition comes with a back panel built with DuPont™ Kevlar® aramid fiber. The super-tough, heat-resistant material is widely used for applications in aviation, military, and high-end cycling. Its well-bred texture gives POCO F1 an elegant look and makes it stand out among common products. The Smartphone is available to purchase now from the Mi Store and Flipkart. POCO F1 bangs the budget segment device range. The POCO F1 comes with all those flagship features at the price of a normal mid-range device. Along with special inbuilt features like the liquid-cooling technology, IR Face Unlock, and smart MIUI based POCO launcher, the POCO F1 has gathered a lot of attention. The camera quality might disappoint you somewhere in low light as compared to the best camera devices but overall if you look from the performance point of view POCO F1 offers you the best of all features at an aggressive price. To know about the other downsides of Poco F1, check out our other article here.